The river of corruption coming out of Washington runs wide and deep. How the Big Lie works; Hillary hires Fusion GPS to get a guy to write a fictional story of Trump hiring Russian prostitutes, sends that story to Buzzfeed who publish it (with the admission that it is unfactual buried deep in the story), allowing the rest of the leftist media to report it and make it a “fact,” and is used by Obama to get a FISA warrant to spy on Trump, and lastly becomes the basis of Trump enlisting Russia to hack the election and steal it from Hillary. That is how the Big Lie works making fiction become fact. and a host of other Democrats are complicit in fabricating a lie that they have been perpetrating at enormous expense to the American people – and I WANT MY MONEY BACK! Democrats have destroyed people, invaded their homes, and wrecked their lives over this lie! It is born and bred of the black heart that is their nature. It is why the Left cannot tolerate the light of the Right. Whenever the Left is caught in a lie they will deny, deny, deny, deflect and project, and then they will find posers to make false accusations of the same nature against their opponents. This is Watergate x1000! Nixon was driven from office over a tiny fraction of what Democrats have done. The entire Obama/Clinton cabal deserves prison for this! Their Never Trump allies deserve to be smacked down and kicked out of the club of righteous Americans for their role in seeking the approval of the Left by smearing Trump. Pray that American’s eyes are opened, that the light shines on the truth, and that the criminals pay the piper at last. If you believe in any of these then you belong to the club of PT Barnum’s suckers born every minute. If you believe in any two of them then you are lost in the wilderness of liberal darkness. If you believe in all three then you fall into the Lincoln category of some of the people who can be fooled all the time. If we can’t have these people prosecuted for their crimes we can at least make sure that they are voted out of power and cast down from on high to wallow in the pit with their lord! These kinds of deception, these kinds of dupes, and these kinds of denials are why the Left must be defeated and not followed. These people have no right to lead when all they do is swindle the people to make themselves wealthy. Democrats are so dysfunctional that they wanted Don Trump, Jr. to be prosecuted for treason for talking to a lawyer from Russia, but hold Hillary sacrosanct for her crimes, bribery, slander, and selling America’s uranium to the nation’s enemies. This entry was posted in Politics and tagged Barack Obama, Donald Trump, Hillary Clinton, Obama spying on Trump Campaign, Russian Collusion, Trump Russia Dossier. Bookmark the permalink. 1 Response to RUSSIAN COLLUSION UNMASKED! 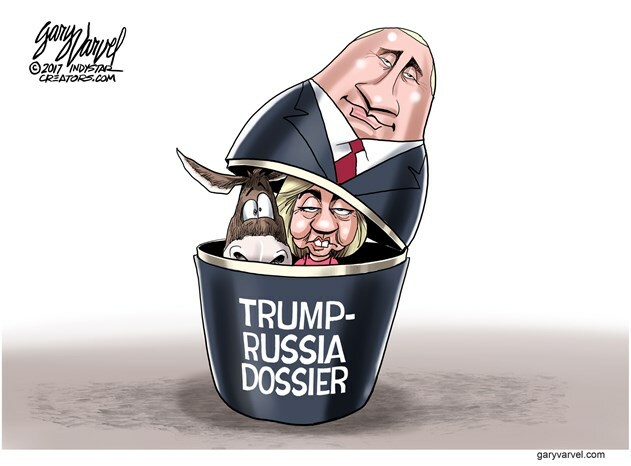 Pingback: RUSSIAN COLLUSION UNMASKED! | Liberals Backwards Think – Shouting from the rooftop. . .